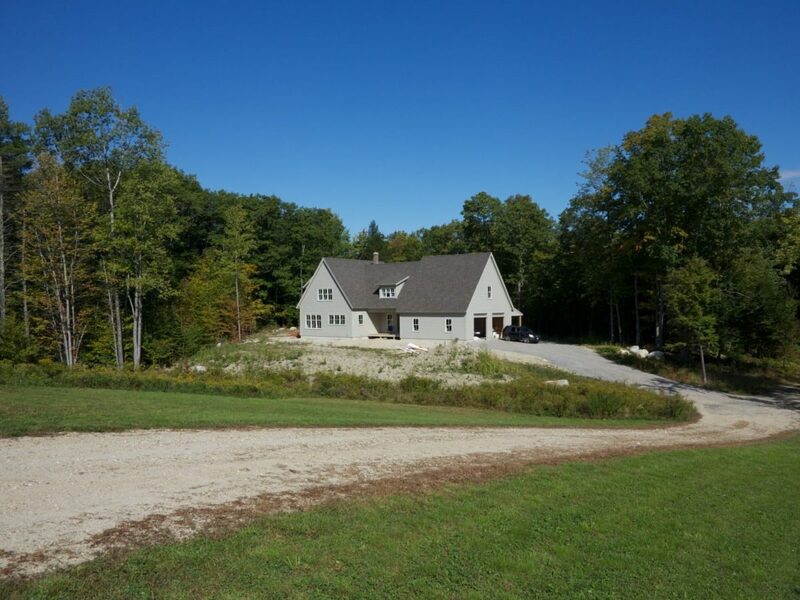 As the mornings cool off and the days shorten, BenCo has moved inside to put the finishing touches on a unique custom home on a spectacular rural lot in New Gloucester, Maine. The house, which Ben designed from the ground up with input from the homeowners, melds traditional New England cape forms with simple, modern, and refined touches both inside and out. The house is sheltered by hardwoods and hemlocks in a corner of the rolling fields that dominate the front part of the lot. With South-Eastern exposure, the front porch tucked between the garage and the main house gets plenty of sun, but stays shaded for most of the day in the warmer months, making it a true three-season extension of the indoor spaces. The steep, South-facing garage roof allows optimum exposure and plenty of space for photovoltaic panels, which will generate a big piece of the home’s electricity in the future. From the main entrance through the garage, exposed hemlock beams and traditional mortise and tenon joinery frame the center window in the main living space. The ell of the house, which houses generously-sized coat and storage closets, a full bath, and a large work space for one homeowner’s business, is built on an insulated slab, and boasts a polished concrete floor. In the rest of the house, locally-sourced hard maple floors with a Vermont Natural Coatings sustainable finish are rugged, practical, and will look great through years of use. In the main living space, big double-hung windows bring in lots of light, while the french doors allow easy access to the North lawn. The back corner, behind the traditional exposed-brick chimney, will be home to a striking stone hearth and an efficient woodstove that will heat much of the house in the winter. The remaining heating (and all of the cooling in the summer months) will fall to “mini-split” heat pump units, the leading edge technology for HVAC. Allowing for precise heating and cooling of the interior climate and incredible performance, these electric units are incredibly efficient and when paired with solar PV panels, can be considered renewable energy heating and cooling! Upstairs in the master bedroom, it’s all about angles, light, and air. A cathedral ceiling under the steep main roof pitch stretches more than fifteen feet above the floor, but careful air sealing techniques and extra-thick rafter bays full of sustainable, practical dense-packed cellulose insulation will keep the space comfortable and the utilities bills low. Even on the hottest days of the summer–and well before any mechanical systems are up and running–the house stays cool and dry! The south-facing triple windows frame a view that would get most of us out of bed any day of the week, while a cavernous walk-in closet with a pocket door to the master bath complete the modern master suite. Posted in Custom Home Design Portfolio .